My dad used to work at the Armory and I learned how to drive in the stadium parking lot. He made me drive a 1966 Ford Country Squire station wagon in reverse around the whole stadium. I later marched in a Northern football game with the Marching Knights. Great memories. I played Junior High football here many times for Carr Junior High. Good times and memories. I also attended an evangelist's crusade meeting here which had the featured speaker as the now famous televangelist, Reverend Jack Van Impe when he was just getting started. His claim to fame then, not to sound detracting of him either, was that he had memorized the entire New Testament of the King James Version of the Bible. This was the mid 1960s if I remember correctly. Great stadium though and I also went to several "Battle of the Bands" concerts there. Mostly always local talent. 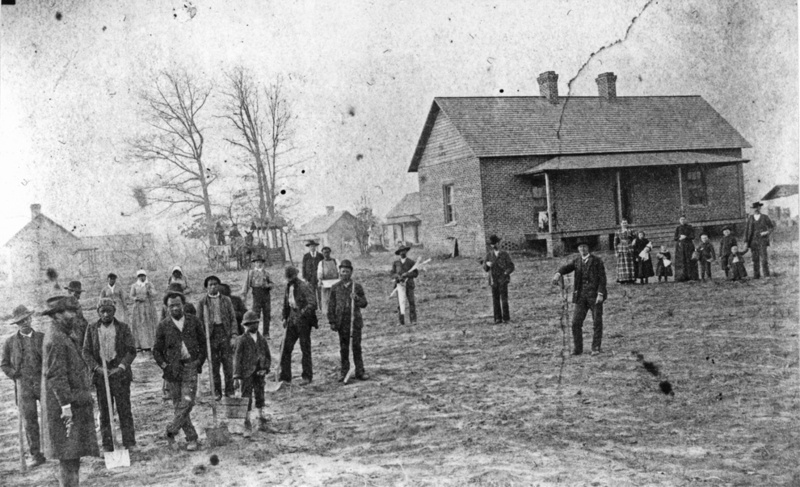 Prison Farm / County Home, 1880s. 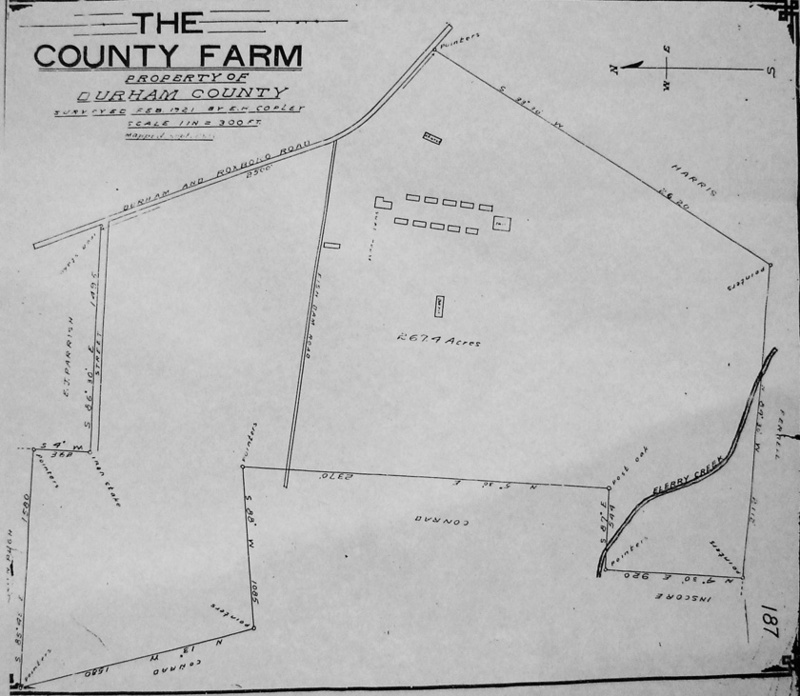 On November 15th, 1881, the County Commissioners purchased a tract of 138 acres of land on Roxboro Road, then about three miles north of Durham, from WA Wilkerson for $1393.75 and erected a frame house for "the care of the aged, indigent and infirm." Brodie Duke, who owned a furniture store at that time, sold the county furniture for the facility. They appointed John W. Evans as superintendent of the facility. In March 1882, the county commissioners also decided to build a prison/work house "for the confinement of criminals undergoing sentences of not over ten years" was constructed "separate and apart, however, from the cottages of the unfortunates of the first named class." 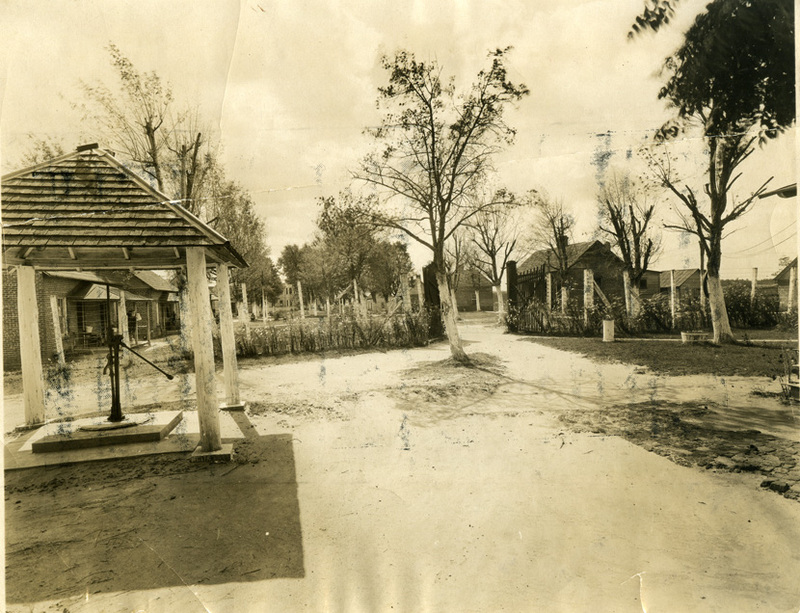 Prison labor, and labor provided by able-bodied, impoverished residents, was used to maintain the facility, including cleaning, cooking, and tending the farm on-site to provide food for the inmates and residents of the poorhouse. The prisoners also did off-site labor such as road work and "such other manual labor as comes least in conflict with free labor." 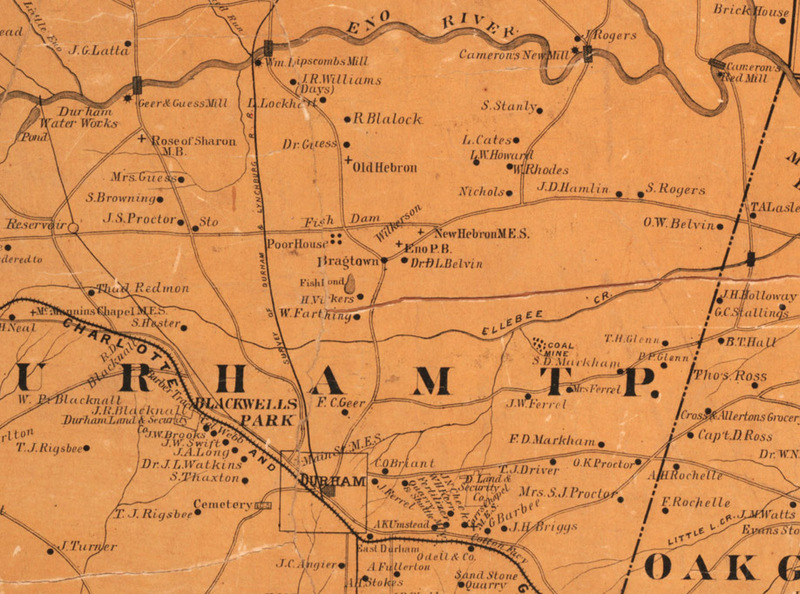 1887 Map of Durham showing the location of the 'Poor House'. "Within the last few years the lands have been brought into a high state of cultivation, whilst neat and well ventilated cottages (some of brick), have taken the place of the poor cabins that formerly served as shelter for the unfortunates whose only crime was being poor and mentally or physically infirm. The poor inmates are now well-housed, clothed and fed, and are surrounded by Christian influences and accorded humane consideration in striking contrast with the neglect, squalor and savagery that prevails at some similar institutions in some counties of the State. Here God's poor unfortunates find a home indeed, instead of a 'poor house' and an inferno. Here they are not surrounded by humiliating reminders of their helpless dependency. A neat Chapel has recently been erected, where lay services are held every Sunday afternoon. To the untiring efforts of the present Superintendent, aided by his subordinates, and supplemented by the Board of Commissioners and County Physician, much praise is due for the truly satisfactory condition of this institution." Although the Grand Jury concluded that “the management of the Poor House is by no means what it should be, being in many respects worse than can be imagined,” the testimonies of guards, doctors, and paupers offered a mixed assessment. The county commissioners ultimately ruled that Evans had not committed “any criminal act or neglect” and retained him as superintendent until Evans quit. By the 1890s, the county home had been enlarged to 9 frame buildings; on a state level, housing of criminals with the impoverished had come under some fire. In one particularly colorful quote, which gives you a sense that not a few of the convicted were prostitutes, Rev. G. William Welker chairman of the State Board of Charities opined that “the respectable, aged, and infirm pauper is shut up with the wornout strumpet, whose very presence is pollution.” Particularly of concern was the rise in children living at the county home - both those that had come with their families, as well as those born at the home. Much of the rise of private charities in the 1890s and early 1900s arose from the failure of the county home to provide adequate care and housing - in particular to those considered 'worthy'. White children epitomized that 'worthiness'. 1921 Survey Map, retrieved from the Durham County Register of Deeds. By 1925, a new Durham County jail had been built approximately 3/4 mi. west of the county home on Broad Street. At least some of the prisoners formerly housed at the county home were moved to that facility, alleviating some of the discomfort arising from the co-housing of the impoverished with misdemeanants. A new County Home main building was built that same year at a cost of $175,000, and the facility became primarily used to house the impoverished and disabled. This use began to wane during the 1930s; Anderson notes that, by 1937, county homes / 'poor houses' were being downsized, their functions supplanted by the rise of Federal and state programs to provide social security and welfare benefits. Durham's persisted, however, providing primarily housing to disabled people. County Home from N. Roxboro Road, 11.06.58. 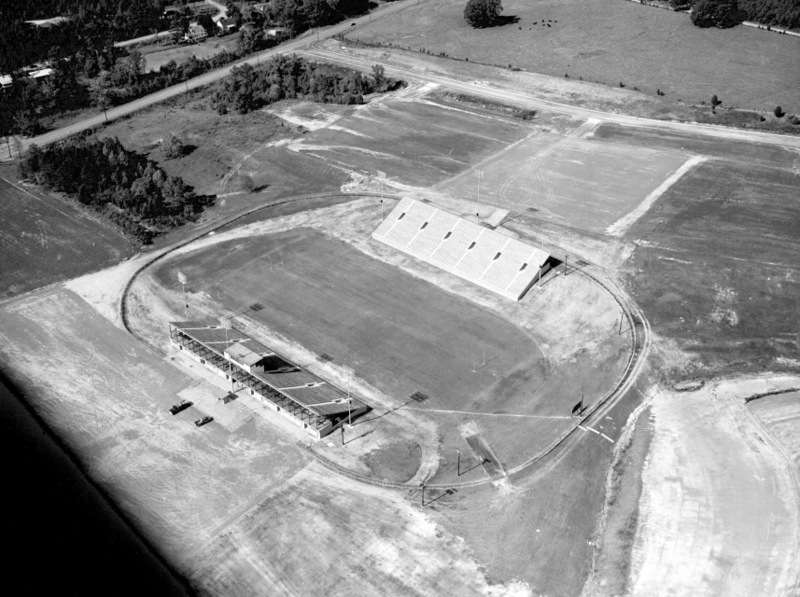 In 1960, Durham County Memorial Stadium was built on a a portion of the county home land, closer to North Duke Street. It primarily provided a football facility for local high school teams. Aerial of the county home site, around 1960, looking north. N. Roxboro Road runs into the background on the right, North Duke St. on the left. The then-new county stadium is visible, and the county home and farm outbuildings are to the right. County Stadium, with the National Guard Armory in the background, 1960. By 1973, the County Home buildings were demolished and replaced with Durham Regional Hospital. The county stadium has hung on since then - in 2003, the county pondered tearing it down, but eventually decided against it. is mostly used for high school football and soccer but also serves as the home field for theBears of Shaw University despite the school's location in neighboring Wake County. Durham County Stadium is the current home for the Triangle Rattlers Semi-Professional Football Team. The minor league organization represents Raleigh, Durham, and Chapel Hill, as well as the surrounding area. The stadium is also one of North Carolina's main archery venues.